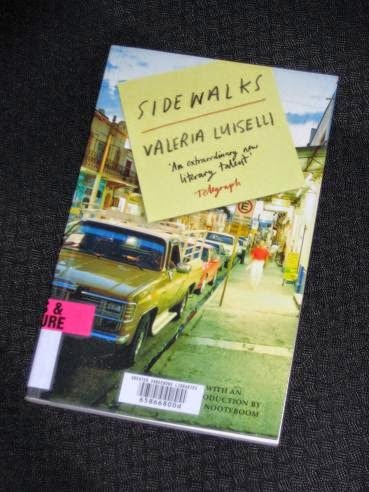 …and that, of course, would have been a shame because Sidewalks is a lovely little find, a book which takes very little time to read, but is one you’d like to dip back into at a later date. The structure of the essays is deceptively simple, with each chopped up into shorter sections, often a matter of a paragraph or two, and they often start off talking about one topic before flitting off on a tangent to look at another – and then circling back to where we began. A few of the pieces also touch on the experiences the writer has when moving around from country to country (as she has done all her life). ‘Flying Home’ starts with an air journey back to Mexico City, with thoughts of home interspersed with musings about the Mexican capital’s (lack of) urban planning, stories of disappearing canals and old maps jostling gently with the frustration of the aeroplane inching slowly across the screen in front of her seat. Sidewalks is a beautiful little book, a wonderful way to while away an hour or so, and it’s one of those rare works where you’re constantly stopping to jot down an observation or copy an interesting line. The writing is witty and laconic, cleverly looping around on itself, and the foreword by Cees Nooteboom is rather apt as Luiselli has a similar style and eye for detail to the (much older) Dutch writer. Firstly, I recently came across this video interview (in Spanish, with English subtitles) in which Luiselli talks about her upbringing. Also, for those whose Spanish is passable, the writer has a monthly column for the El País newspaper, a series of short observations on life in New York. Finally, if your language skills are really good, her third book is already out – La Historia de mis Dientes is available in Spanish now (the rest of us will have to wait until the end of 2015…). Nice review, Tony. I'm so glad you enjoyed this collection – lots of interesting ideas about spaces, locations and cities. The melancholy tone came through very strongly for me, too. I loved this like yourself and Jacqui a wonderful talent isn't she both fiction and non fiction ,only problem with this there wasn't enough of it I could read four or five times as many pieces and not been bored .